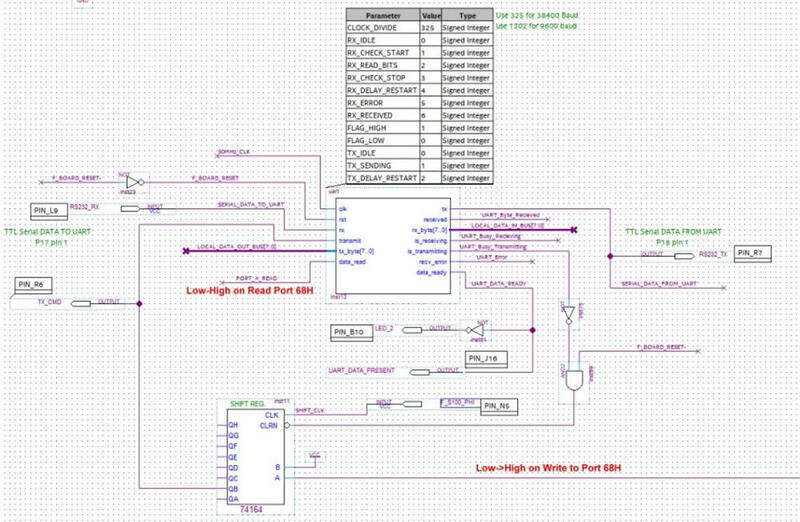 A UART I/O Port FPGA Code Example. This circuit example adds a very basic RS232 Serial Port to the FPGA Prototype board. It assumes the user is familiar with RS232 communication hardware. If not, please read the discussion about our Serial IO board here first. 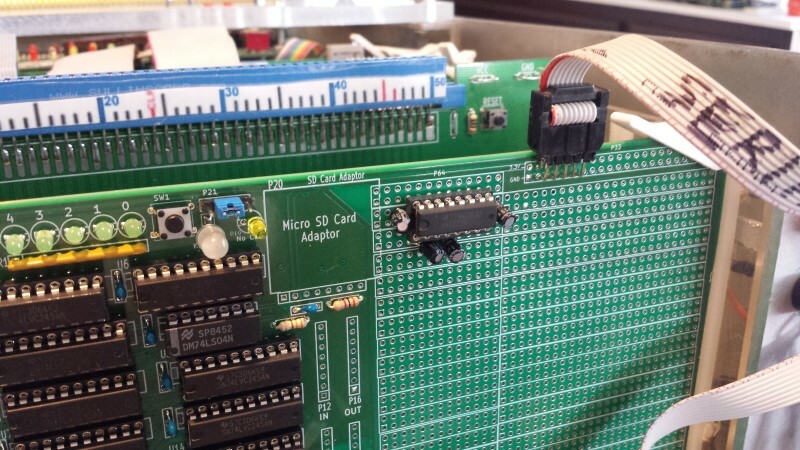 The actual hardware on the board consist of nothing more than a 2X5 pin connector (to connect a ribbon cable to a DB9 socket at the back of your S100 box) and a MAX232 RS232 voltage level shifter with 4 capacitors. Here is a schematic and picture. Below is the core FPGA Code. The core UART Verilog file (Documented Verilog UART by osdvu) was downloaded from the OpenCores site (Communications Controller section). The first thing to note is that the actual file is a Verilog file, named in this example UART.v. Since we are working with a .bdf file we must convert this file into a block diagram. You do this from the Quartus File menu. Select "Create/Update" and the "Create Symbol File From Current File". Be sure and store it in the same folder as your main .bdf file. The UART diagram will appear as a rectangle with inputs on the LHS and outputs on the RHS. Read the Verilog UART.v file to understand their function in the documentation. In my hands I found the UART code to flag when a character was received by the "UART" was not latched. I needed a way to always know when a serial character has been received. I modified the UART.v code to add an extra output as a flag (UART_DATA_READY) when a character is received. This flag is reset when the data is read by the S100 bus system by PORT_A_READ. Also because the gates in the FPGA is so fast, there needed to be a delay in sending out the 8 data bits serially when pulsing "transmit" high. A 74164 shift register did the trick using the S100 PHI signal as a clock. Here is the core diagram. The "UART" can be programmed to work at any common Baud rate. The two you may want to use are 9600 and 38400 Baud. 9600 is the baud rate we used with the UART on out PDP11 CPU board. You can first use that board if you have it working to check your serial connection to your PC is correct. Then switch the connection to this board. However the most useful Baud rate is 38400 Baud. This is because it is the baud rate our Z80 Master monitor uses to communicate over a serial line for the "X" command. This command utilizes our Serial IO board to download .com (binary) files directly to a RAM location from (for example) your PC. While the PDP11 board UART uses 2 stop bits, this UART works with 1 or 2 without any modifications. IO_TEST1.Z80 This Z80 program (at 100H in RAM) sends keyboard characters from our FPGA UART out via the RS232 Serial line to a remote terminal. IO_TEST2.Z80 This Z80 program (at 100H in RAM) reads keyboard characters from a remote terminal via our FPGA UART and prints them on the S100 Bus console. IO_TEST3.Z80 This Z80 program (at 100H in RAM) combines the above two programs. The typed character on the remote terminal is returned an printed. From Absolute Telnet (for example), launch a program to transmit over a serial line in a XMODEM format IO_TEST3.COM to your S100 system Serial IO board. As I said above the default MASTER monitor assumes 38400 baud., 1 stop bit, no parity, so you can switch serial port connections quickly and easily. Please take time to fully understand the above FPGA code and what is going on. This apparently very simple "program" encapsulates many of the major concepts of FPGA programming. Try and understand the function of everything there. BTW this RS232 UART/Port is an absolute bare bones connection. I use an RS232->USB adaptor to interface with my PC. A classical RS232 Port should also implement RST, CTS, DTR etc. signals.